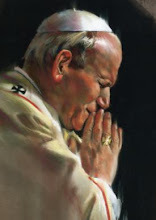 Before my wife and I entered the Catholic Church in 2005 I found myself spending increasing amounts of time in Eucharistic Adoration at our local perpetual adoration chapel in Grand Rapids, MI. As a young twenty-something Baptist I was struck by the sense of peace I found in this "sacred space." During my three-year journey into the fullness of faith I started attending Adoration even before I went to Mass on a regular basis. 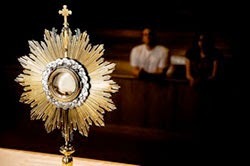 The fast pace of life had left me constantly strained and stressed out and Catholic friends suggested I spend quiet time in prayer at Adoration to regain my bearings. The chapel was less distracting than praying at home and Protestant churches were not open late at night. As time went on I started to retreat there more and more often and Jesus allowed me to enter into His rest. The very act of spending time before the Lord, exposed in the Eucharist, transformed me even if I did not yet fully realize the implications for my family. The Catholic Church offered something that would fulfill an immediate need I had in my life. Looking back I realize now how Christ was working on my heart in those silent moments. In speaking about the Eucharist Benedict XVI said: "Christ's death on the Cross is the culmination of that turning of God against Himself in which He gives Himself in order to raise man up and save him. This is love in its most radical form" (Sacramentum Caritatis, n. 8). Cardinal Raymond Burke follows up, "The Crucifixion, Death and Resurrection of our Lord are, in fact, only fully understood in the context of the Lord's Supper, the Eucharistic Sacrifice and Banquet" (Divine Love Made Flesh, 80). No wonder then, that I felt so at home and at peace in Adoration. I was with Christ who was pouring out His love for me. After my conversion and since accepting work as a Director of Religious Education (who also does youth ministry), I take every opportunity I can to help my parishioners spend time with Our Lord in the Eucharist. Many of my parishioners have also been transformed by the evangelistic power of Jesus in Eucharistic Adoration. Our youth started experiencing Adoration in the summer of 2007 at their first youth conference at Franciscan University of Steubenville. With no prior knowledge, prompting, or leading by any of the staff, two of our teens experienced a gift from the Holy Spirit known as "resting in the Spirit." While it is difficult to define, Fr. Robert DeGrandis describes this grace as a "full surrender of the body during prayer when a person can be literally overwhelmed by the power of the Holy Spirit and falls to the ground in a peaceful state of prayer." Many of them experienced healing and one teen even felt convicted by Jesus to immediately go to the Sacrament of Reconciliation. This girl told our youth group about how she had been resistant to go at first, but how free she felt after Confession. When we got back to the parish our teens cornered our pastor in the sacristy after Mass and demanded more opportunities for Adoration at the parish. They had fallen in love with Jesus. Our startled pastor was only too happy to oblige. Over the next few years we expanded opportunities for Adoration at youth ministry events such as our New Year's Eve lock-in and our opening and closing of the year ceremonies for our Parish School of Religion. Our parents share with me how much they love having Adoration and how it has given them a new and deeper relationship with Jesus.